Yesterday the hubby and I went to an awesome Derby Day/Cinco De Mayo/Retirement Party at a friends house. Plenty of good food, enjoyable company, and lots of laughs. I love afternoons spent with friends! The hostess requested I bring something sweet. I didn’t want to do something traditional like cookies, brownies, etc. Not enough pizzazz for such a momentous party. Plus, some of my foodie friends were there. Can’t let them down. And I needed a nice post to follow up my Derby themed food week. This little tart is divine. Just enough sweet but still plenty of tart lemon flavor. And the rosemary adds a special feel to it. This is perfect for a summer picnic, BBQ, or even a baby shower. It was easy to make and was a big hit at the party. In a food processor, add flour, sugar, rosemary and salt. Pulse to mix. Add in the butter, blending until there are no more chunks of butter. Add the egg and pulse until the flour mixture becomes dough like. On a floured surface, turn out the dough and kneed until the dry dough bits are mixed in. 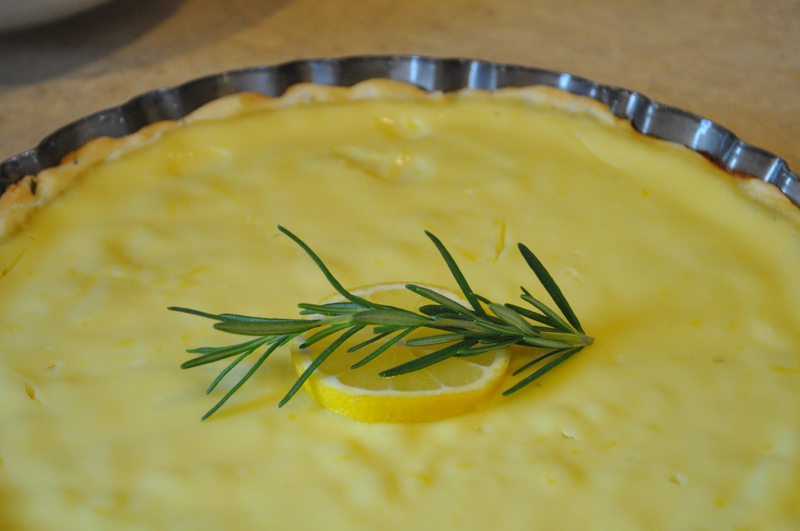 Press into a tart pan or a glass pie plate. Freeze crust for 30 minutes before baking. Preheat oven to 375 degrees. Center a rack in the oven and preheat the oven to 375 degrees F. Butter the shiny side of a piece of aluminum foil (or use nonstick foil) and fit the foil, buttered side down, tightly against the crust. Bake for 20 minutes. Set aside to cool while you prepare the filling. In a bowl whisk together the yogurt and the sugar. Add in the lemon juice and zest. Add the eggs. Mix well. Pour into cooled tart shell. Bake for 20 to 25 minutes on 375 degrees or until center is set. Refrigerate for an hour or until cold. (You could also make this in advance if needed). That looks divine. I love the combination and that crust just really puts this over the top. Thanks! It was very tasty. I am actually drooling. No joke. You should make it! LOVE it!